So said a 30ish male at Okemo, reacting to members of the 70+ Club racing, including some in their eighties and one in his nineties. 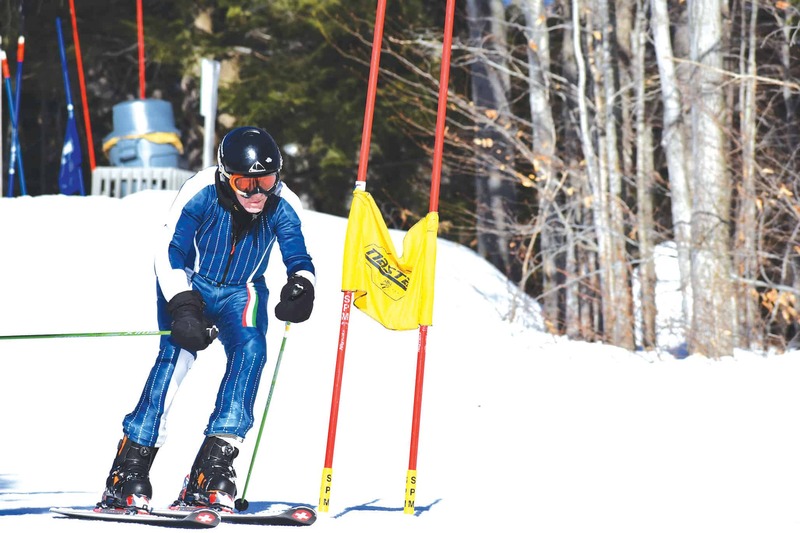 Another man quietly confided he was 75 and shared his ailments but like the other skier expressed appreciation for the young-at-heart seniors who were racing — most just for fun but several in racing suits. Babara Favale was there cheering her husband Tony on at the finish. She’d had several surgeries, including a “serious rotator cuff,” and isn’t skiing this year but plans to next year, she said. She’s also going on the 70+ Breckenridge trip. 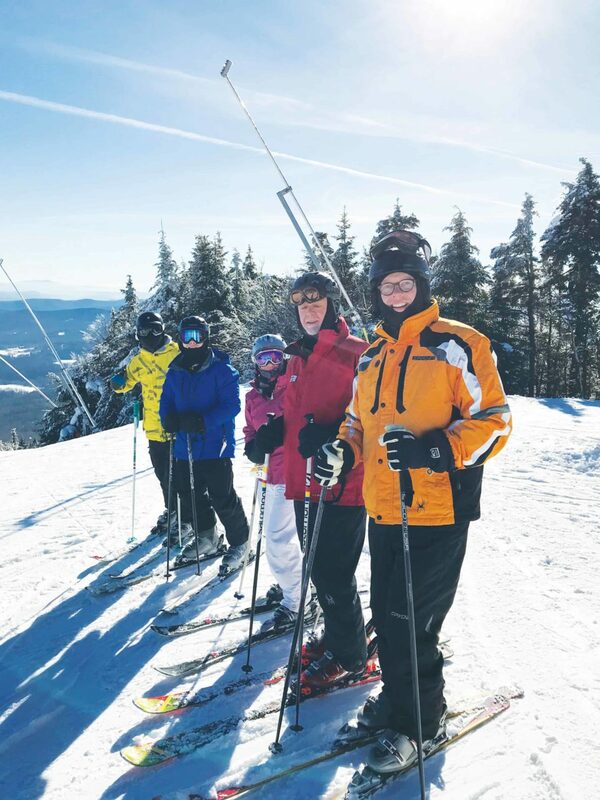 “We go all over,” she added, citing travel, social life, and staying active as important to her and reasons for being part of the 3,500-member 70+ Ski Club. Lloyd Lambert (1901-1997) founded the 70+ Ski Club in 1977. The club for seniors continues to thrive today and is “really a culmination of a life spent promoting a sport he loved,” said grandson Richard Lambert Jr.. who currently leads the club. But while he might have relished recognition by his peers, “getting his audience out on the slopes was what really motivated him,” Lambert noted. Dismayed that fellow seniors were giving up skiing because they could no longer afford it on fixed incomes or had no one to ski with anymore, Lloyd contacted many of the ski resort owners he had built relationships with and persuaded them to offer free skiing for 70+ skiers. 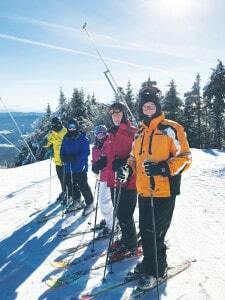 “Free skiing was essentially the tool my grandfather used to accomplish his real goal, which was to keep seniors active. He hated to see folks wasting away in rocking chairs.” said Lambert. At Okemo 41 members raced, including a member from Canada. The race is done by gender and five-year age categories (70-74, 75-79, 80-84, etc.) and by ski and snowboard. “Only one of our three snow boarders raced. The oldest racer was 90 and won his category. He also earned a silver NASTAR pin,” Lambert said. This season the club has three day events and six week-long trips, including trips to Big Sky, Quebec City and Japan. And that’s been a long life as he began skiing on fields around Newport, NH, in the 1940s and at age 10 was the first person to ride the Mt. Sunapee single chair at its Dec. 27, 1948 debut. In 1957 he missed being the one-millionth rider when he let a girl go ahead of him because he was tightening his long thongs. But a few years ago, he was one of the 70+ clubbers photographed for a Japanese television program about the club so he counts his ski adventures as a continuing fun part of his lifelong love affair with the slopes. “This was the group’s 10th consecutive year at Okemo and 30th Vermont Ski Fest (most previous years were at Cortina Inn). We always have a great time and plan to be back next year,” Lambert reports. 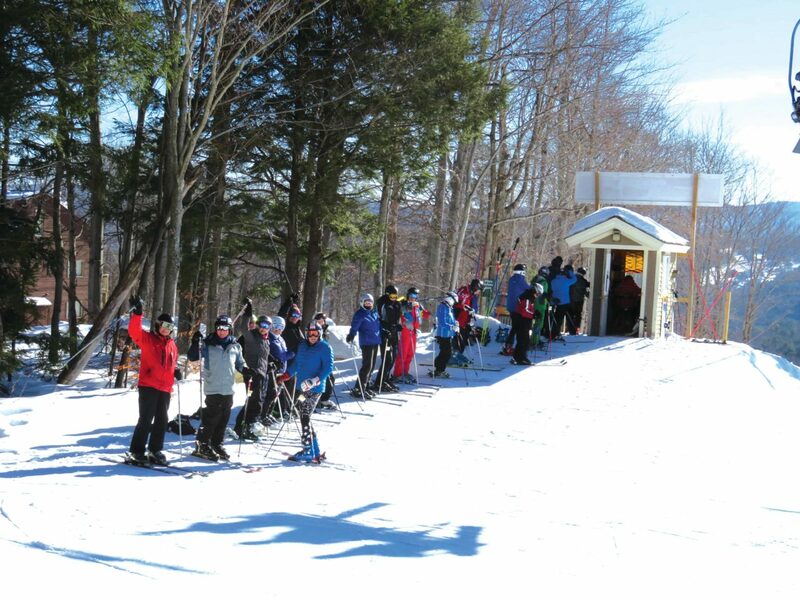 Members of the 70+ Ski Club stand during a recent gathering at Okemo Mountain Resort. The group regularly skis and races in the area.